I saw this email in my mailbox, at about 3.30am in the morning. I’m just about head to sleep and this mail jolted me awake. Someone actually triggered a transfer request of my domain. The email looks legit. It’s from Tucows, sent from Hostica.com. 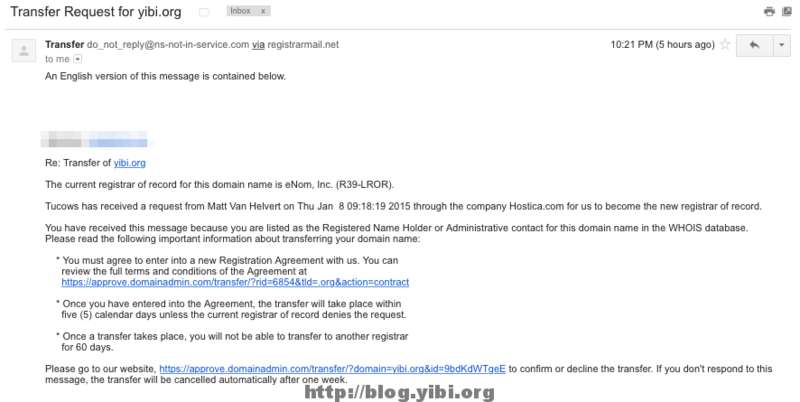 So someone with a hosting account with Hostica submitted a request and to transfer my domain over. There are many reasons why this would happen, but I doubt this is a careless mistake. I regard this as a malicious attempt to hijack my domain. Although in the mail it’s stated that I can actually go to the link at the bottom of the mail to decline the transfer, I decided not to do anything at all. Reason is simple. I do not have absolute confidence that the link is legitimate. Clicking on the link might straightaway approve the transfer. The domain in the link does not point to Tucows. I know this can be verified with whois results, but I’m paranoid. Ok? Additionally, I went to my registrar and made sure my domain’s status is locked. I will be writing to Tucows to have them cancel the request immediately. While the request becomes invalid after a week, I just don’t feel comfortable. My domain is used for my blog with moderate traffic, so I’m guessing the hijackers might be trying their luck over dozen of domains. Someone might just accidentally click the approval link and lose their domain. So folks! Beware!